The Bensons bring the Citizen story arc to a strong conclusion in this issue. 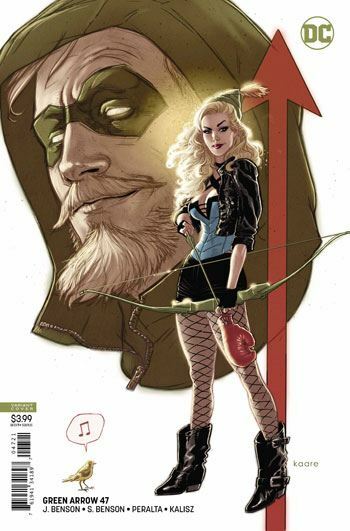 The last issue ended with quite the cliffhanger; Oliver Queen a captive of Citizen, about to be executed live. 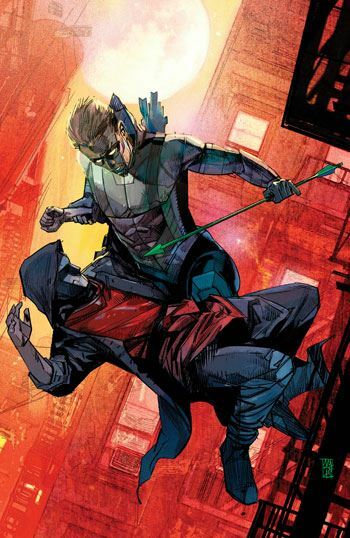 I really liked the way the writers got him out of his predicament, with a different Green Arrow swooping in to save the day. Who is the different Green Arrow? Not saying a word. You’ll have to read it for yourself. Overall, this storyline has been a very well crafted mix of super hero action and higher ethical issues. It’s not always easy to blend a message in with a story. It can often feel forced, or preachy. It’s a real credit to the Bensons that they pulled off this storyline without ever descending into that trap. Instead, we got some solid Green Arrow entertainment, with the larger issues just serving as a highlight, to be thought about afterwards. And in the current political climate, it’s really important to get Green Arrow right. He is a flawed left wing hero, often hypocritical, but always determined to do the right thing. It’s easy to have fun with that sort of character. It’s far more difficult to make him real and sympathetic. The superb job the Bensons have done on the book since taking the reins makes me very excited about next issue. Count Vertigo’s return is teased, and I am hoping for the real thing. I didn’t care much for the version introduced during the new 52, and I want the Vlatavan aristocrat back. I guess I will have to wait and see how they choose to handle him. But given everything the Bensons have done with the series, my expectations going forward are very high.